Truthfully, I was not sure at first just how these actually fit together: this business of taking up our cross and going after Jesus and pouring a bucket of ice water on your head. What I did recognize in myself is that as more and more people I knew were posting videos on Facebook depicting their own ice water showers, I was finding myself wanting to cyber-duck so as to avoid being called upon to do the same. For I knew when I was called out, I would have to do it. There would be no turning it aside. Some argue against it saying it's a gimmick and that many who are doing it aren't actually giving to the cause. The ALSA would counter that, pointing out that donations are up significantly as more and more people publicly speak the name of this dreaded disease out loud. One Catholic Diocese is forbidding its schools to participate for a small segment of the organization's work goes into embryonic stem cell research. OK. I suppose I see their point if that's your position, but would you then just ignore the thousands who are suffering from this disease? More than that, I'm told that you can designate your gift specifically so that it does not go against your faith values in this way. And then there is the one where it is asserted that to dump the water over your head is like "sounding the trumpet before you in the synagogue..." reminding us that our 'alms' should be given in secret and God who sees in secret will reward us, quoting Matthew 6:3-4. This one does raise an important caution, it seems to me, but it also goes to motive. Something which is especially difficult to judge in another. More than that, somehow the benefit of raising awareness about this disease outweighs this one, at least in my mind. And yet, even with all of this? If I'm honest, I didn't want to do it because it looked uncomfortable and more than that, undignified. (Not that anyone who knows me would probably use the word 'dignified' to describe me.) Either way, I was hoping no one would notice that I had not yet been challenged. Of course, finally, I was. Now, I can't say why for sure, but it was only after the challenge was issued to me that I found myself pausing in the memory of the only person I have ever personally known who had ALS. It was mine to call on her when I was still a young pastor and if I'm honest, it was never an easy visit. By the time I became her pastor, Shirley's disease was well advanced. She lived alone with scheduled caregivers who would get her up in the morning, prepare her meals, and get her back into bed at night --- not to mention assisting her in all of her personal needs. By the time I met her, her ability to communicate was minimal. I simply could not understand her when she would try to speak. Even so, whenever I entered her home through her unlocked back door and found her, always in her chair in her living room with the television blaring for noise, companionship, distraction, or perhaps entertainment, Shirley's eyes always smiled at me. Still, sometimes I would ache for the time to pass so I could get on to the easier parts of my call. There was only so much I could think of to say to fill the silence. I had not yet learned that sitting quietly really could be enough. I have watched dozens of these ice bucket challenges fulfilled over the last couple of weeks. Almost without exception when the cold water hits the one being 'dumped on,' he or she involuntarily jumps up from their sitting position. The automatic 'flight' system kicks in. It strikes me that there is a certain kind of fitting irony in this for one in the advanced stages of the ALS would in no way be able to get herself out of the way of an icy shower or anything else that threatens. Now of course, a moment's discomfort doesn't begin to compare. And my small donation and the donations of others who may see me do so, may not make nearly enough of a difference to those who suffer from ALS. At the same time, I can't help but wonder at how many times I have not picked up even the tiny 'crosses' which lay in my path and taken off after Jesus because it didn't seem like enough, it wouldn't make enough of a difference, there were plenty of arguments against it, or it was just plain 'undignified.' I wonder at that and I wonder if only I would have allowed myself to take just the first step, if I might not then have found myself taking yet another and another one after that, moving more fully into the life that Jesus intended for all who seek to follow him. 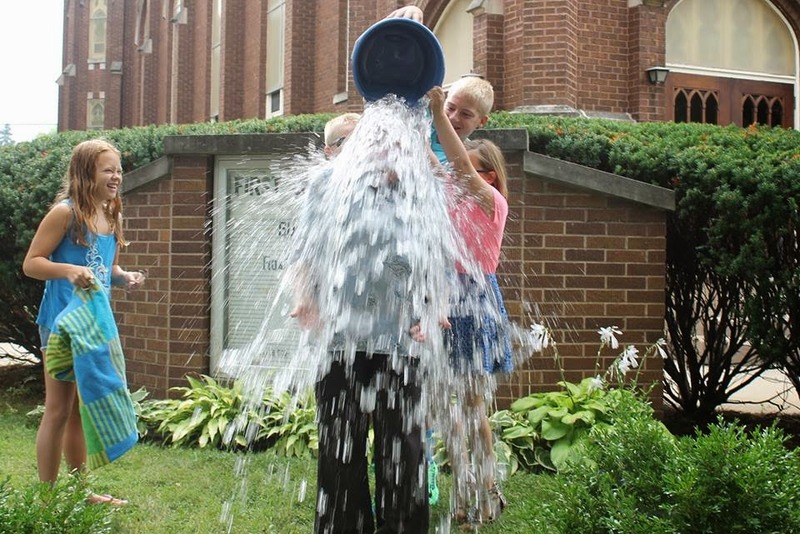 So as you can see above, this morning I took the Ice Bucket Challenge for ALS Research. I did so in memory of Shirley who taught me what this disease looks like and in hope for all those who will ever suffer from it, that healing might somehow be theirs. I did so in front of my congregation after coffee hour on Sunday morning. (If I'm going to look 'undignified' I might as well have an audience!) I did so knowing that this very small thing is nowhere near enough, but also experiencing the truth that already it has opened my eyes and heart again to a kind of suffering I hadn't necessarily thought of much lately. I expect I am changed in that and so then perhaps is my very life and maybe in some small way, so is the life of the world. Indeed, there are usually countless arguments against taking up our crosses and following Jesus. Many of them good ones and occasionally they are ones which should be heeded. Indeed, in my experience no earthly path, no human motive is ever entirely 'clean.' Given this certainty, it is easy to become paralyzed and do nothing. So maybe it does take something as shocking as a bucket of ice water over my head to get me moving again. Or its equivalent metaphor in life itself. Maybe the call is to just get up and get moving and trust the rest to God. Or to force myself to stand still and let the ice cold water stream over my senses. What do you think? I have used this example as a way to consider why it is that sometimes we don't 'pick up our crosses' to follow after Jesus. Can you think of other excuses we might use? Jesus reminds us that we only live by dying. Again, a bucket of ice water is a paltry example, but it is something which may get us moving in the right direction. Indeed, this 'viral experience' has me remembering the suffering of one I had not thought of in years and I find it turns me towards the suffering of others even now. In a way that does deepen and enrich my living. When have you also known this to be so? janet - My mother had ALS over 50 years ago. When I remember how rapidly she declined in less than 2 years, I realize how much has been accomplished. However, like you, I do not want to take a bucket of ice water to show my support. Does giving the big money lessen our guilt rather than actually doing something. I have felt and observed this in missions. I am a retired missionary and still doing work in Liberia. This is the way I am heading with it.